The majority of ARP and Civil Defence personnel were issued with a dark blue wool beret. Many affixed their silver or base metal ARP lapel badge to these berets and this was officially sanctioned by the Department of Home Security in 1942. The men's button-hole fitting was to be used with a piece of cardboard behind but the brooch pin style was sought after and initially even ordered by local authorities. However, the Department of Home Security declined to issue extra badges to CD members just for the beret. Private companies had been manufacturing small circular embroidered CD badges manufactured for the beret for private purchase during 1942 and into 1943. They featured a King's crown with CD letters within an old gold circle and were a copy of the breast badge. 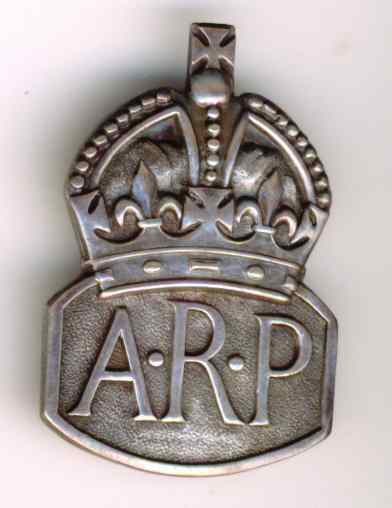 With the issue of metal ARP badge being stopped in early 1943, a beret badge was then needed for those without a badge. The Department of Home Security reviewed the embroidered badge and ordered 200,000 calico-printed versions in the summer of 1943. All embroidered versions are therefore private purchases. 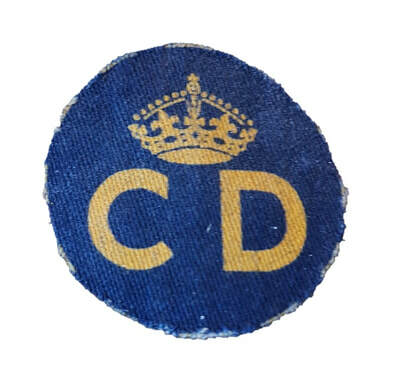 Printed Civil Defence CD beret badge. 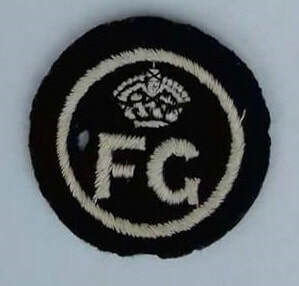 Fire Guard embroidered beret badge. There are period photographs showing side caps worn. Many were private purchases and if a local authority wanted to issue them they would have to pay for this themselves. Again, most wearers added their metal ARP lapel badge to their side cap. ​Some areas in London, such as in Lewisham, seem to have had an ample supply of side caps. 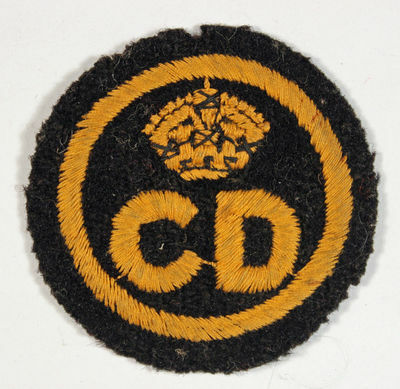 Many senior members within the Civil Defence wore side caps with yellow piping but, going by photographic evidence, they were available to all ranks. There is photographic evidence of the CD breast badge being trimmed and used on berets as well. A number of local authrorites sought permission to create county badges featuring the emblem of that county. Usually permission would be given if the costs were met by the local authority. 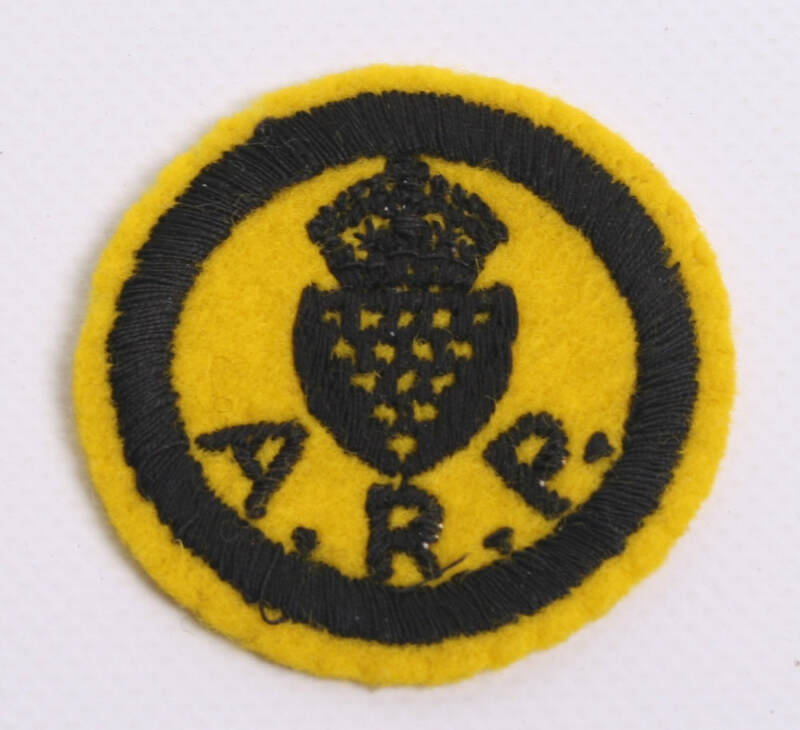 Some Rescue Parties used an existing red on black ARP badge as a beret badge. The letters A and P were unpicked and the badge was sewn onto the beret. 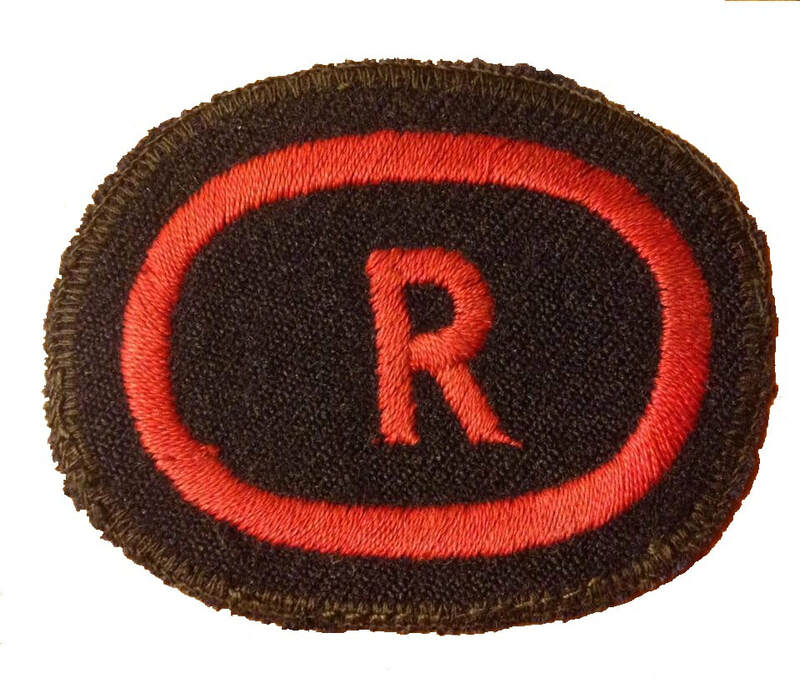 Rescue Party "R" beret badge.